undergraduate students in the Summer Science Research Program worked with graduate students and faculty in science labs on and off campus. 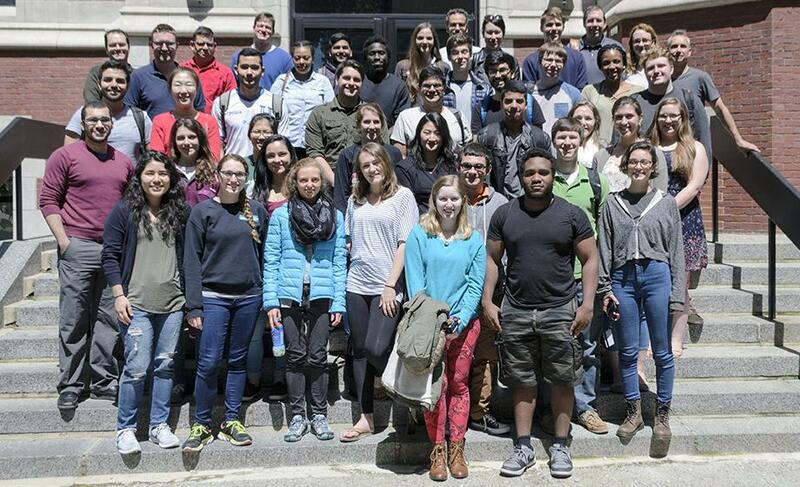 More than 40 undergraduate students participated in Clark’s Summer Science Research Program, which featured weekly lectures and mentorship by faculty. “One of the many positive aspects of this program was the bringing together of students, and faculty, from very different fields,” says Denis Larochelle, associate professor of biology and director of the Biochemistry and Molecular Biology Program, who leads the summer program with Deborah Robertson, Warren Litsky ’45 Endowed Chair and professor of biology. Lecture topics throughout the summer included the research process and best practices (presented by John Magee, assistant professor of computer science, and Néva Meyer, assistant professor of biology); science communication (John Gibbons, assistant professor of biology); peer review and publishing in the sciences (Mark Turnbull, professor of chemistry); data presentation using figures and tables (Philip Bergmann, associate professor of biology); and networking and other career skills (LEEP Center staff). The students received funding from the LEEP Center, Carlson and other departmental endowments, and a major national funding agency that wishes to remain anonymous. The students worked with faculty in labs on campus and with research partners at Boston University, Wellesley College, PCI Synthesis and elsewhere. At the end of the summer, the students shared their research findings with each other and Clark faculty in a series of quick “elevator pitches.” The goal? To describe the significance of their research in an accessible way to those outside their respective disciplines.